From back, left to right, Tyler McClellan, Dalton Gibson, Reid Fracchia, Davis Rippee, Kyle Kantor, Mac Temple, Steven Winford, Parker Kennedy, Nathan Lucas, Nic Beddingfield, Brennan Canton, Ben McDowell, Cory Tirman, Caroline Nall, Hannah McCowan, Amanda Ray, Glennis McWilliams, Annalee Purdie, Rose Maxwell, Madison Carroll, Georgia Gibson, Robyn Hadden, Clarke Wilkirson, Sydney Hays. Not pictured are Rebecca Nosef and Bryn Noble. ACT scores among Jackson Academy students are showing an upward trend in several categories. 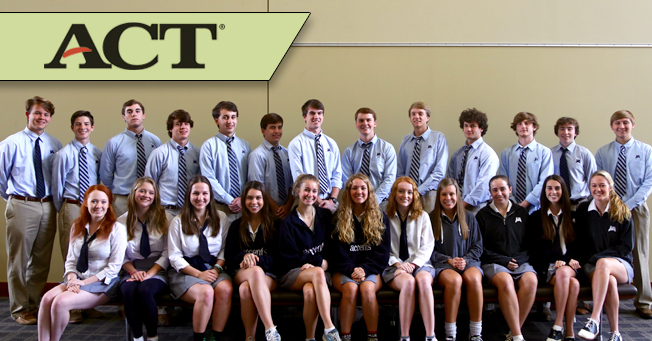 The class of 2015 averaged a composite score of 25.3, up from the past two years and above JA’s recent five-year average of 25. The state average is 19 and the national average is 21. Two particular categories of JA test takers demonstrate notable figures. Students attending JA since Lower School averaged 26.2 this year. Students in advanced curriculum averaged 30 in 2014 and 2015. Overall, 28 percent of seniors have already scored 29 or above to date, making them eligible for Mississippi’s Eminent Scholars Grant, a $2500 per year grant awarded to in-state residents pursuing their first degree at an approved post-secondary institution in Mississippi. Recipients of the grant also must have maintained a high school cumulative grade point average of 3.50 on a 4.0 scale. Testing dates remain for this ACT testing cycle, so additional Eminent Scholars are expected. Juniors are also scoring 29 and above at a rate similar to the senior class. While scores are showing an uptick, counselors are quick to point out that the ACT score is just one indication of college readiness. “JA is on the leading edge of preparing students for college success,” said Amy Bush, JA college counselor. “Our students are prepared for college and are successful in college.” The school engages students in early college and career awareness, helps students set high aspirations, and ensures that they plan a rigorous Upper School course load. Counselor and Coordinator of Student Services Paula Pratt said three factors play into students’ testing success: their regular classroom course of study; workshops and classes designed for ACT preparation; and JA serving as an ACT testing site. “Preparation for college admissions testing starts in the classroom,” said Pratt. “What occurs every day in the classroom is key to students reaching college readiness benchmarks. At JA, regular classroom preparation has proven effective for preparing students.” A college readiness benchmark is a score on each of the subsections (English, math, reading, and science) of the ACT that the ACT, Inc. uses as the minimum score that would predict college success in that area. JA also offers classes and workshops for students who wish to go beyond regular classroom study to advance their scores. JA takes serving as an official ACT testing site very seriously, so it arranges for qualified proctors and maintains a quiet and orderly testing environment. Pratt says that letting students test in classrooms that are familiar to them in desks that are comfortable for extended testing can make a difference. Students can test at JA at all testing dates except June. Also, students from other schools can test at JA. “Helping students reach college readiness is an important task of any school, and we are pleased with JA’s success in preparing students for college. Our mission includes helping students lead lives of purpose and significance. ACT scores are just one measure of preparation, and we encourage families to consider scores along with other qualities their children possess, such as grade point average, leadership, service, and artistic or athletic giftedness, when preparing for college admissions,” said JA President Cliff Kling.